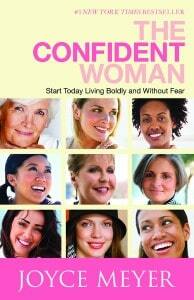 While The Confident Woman: Start Today Living Boldly and Without Fear by Joyce Meyer has been out for a few years, it recently came out in paperback. I had never read a book by Joyce Meyer, so I was surprised to learn that she is the author of a number of books, including: I Dare You:Embrace Life With Passion;Conflict Free Living; and Approval Addiction: and Overcoming Your Need to Please Everyone among others. As I wasn’t familiar with Joyce Meyer’s writings, I was also unaware that Meyer also has a ministry. So, when I began reading The Confident Woman, I was surprised to discover that the message behind being a confident woman was based on Biblical scripture as well as ideas presented by Meyers herself. That being said, I actually enjoyed some aspects of this book. While I am not a devout Christian, I am comfortable with Christian ideology. Meyer writes about how you can use faith as a basis to develop yourself and become a more confident woman through various steps. While I may not agree with everything that Meyer suggests, I do think that her book could inspire confidence-building for some people. I think this book does have an audience and can be, at times, both motivational and inspirational. In my mind, readers who are Christians (or at least accepting of Christian philosophy and ideology) may be interested in this book. Dropping in from Monday Madness..LONG time follower & I’m loving your new layout! .-= Melissa´s last blog ..Someday… =-. .-= Kim´s last blog ..A Monday Madness Blog Hop =-.